BOSTON, Mass. - Freshman Mackenna Parker and sophomore Kristina Schuler each scored a career-best two goals to lead the No. 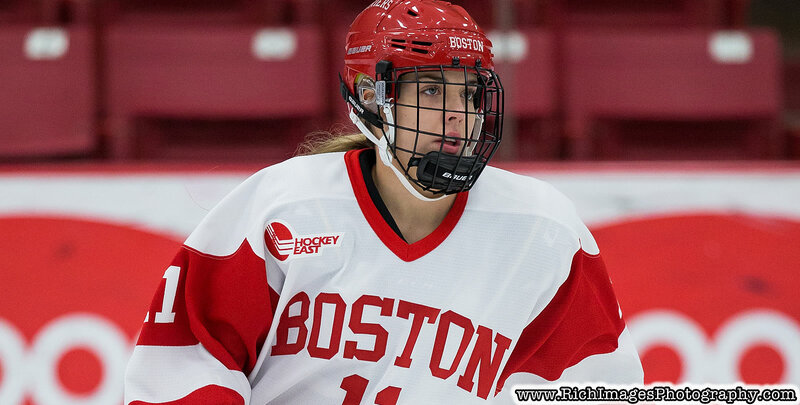 10 Boston University women's ice hockey team to a 6-3 victory over Merrimack on Friday night at Walter Brown Arena. Schuler's second strike of the game closed out a four-goal second period and proved to be the game-winner. The sophomore bookended that sensational stanza, with Parker and freshman Emma Wuthrich also lighting the lamp during that frame. Parker finished the game with a career-high three points thanks to an assist on Schuler's winner. Merrimack scored twice in the third period, including a goal with 1:00 remaining in regulation, to cut the deficit to 4-3, but redshirt junior Sammy Davis found the back of the net with 39 seconds to play and Parker followed with an empty-netter to seal the victory. Junior Deziray De Sousa and sophomore Nara Elia each assisted on both of Schuler's goals to match their career highs while senior tri-captain Reagan Rust also added a pair of assists. Davis recorded an assist to finish with two points while sophomore Jesse Compher and junior Abby Cook each assisted on Parker's final goal of the contest. BU (14-6-5, 11-5-4 WHEA) extended its win streak to six games and also moved four points clear of fourth-place Providence for third in the Hockey East standings with the win. Merrimack (14-9-3, 10-8-1 WHEA) now sits in fifth place, five points behind the Terriers. - Merrimack scored the lone goal of the opening frame when Mikyla Grant-Mentis knocked home her own rebound just 2:20 into the proceedings. - Schuler secured an equalizer at 10:33 of the second stanza. Elia got the puck to De Sousa, who then skated into the Merrimack zone and feathered a pass for Schuler on the right wing. The sophomore then ripped a shot inside the left post to even the score. - Parker gave the Terriers a 2-1 lead just 1:05 later when she redirected a Rust shot past Samantha Ridgewell (31 saves). - BU ended the period with another flurry of goals, this time just 52 seconds apart. Wuthrich began the sequence with her third strike of the year as she knocked in a rebound after Elia nearly deflected a De Sousa pass home. - Schuler then notched her second of the game with 1:56 to play in the stanza. Parker intercepted a Merrimack clearing attempt at the blue line and quickly dished to Schuler, who brilliantly faked out Ridgewell with some slick stickhandling for her third goal of the season. - Grant-Mentis completed her hat trick with a pair of third-period markers, with the last goal bringing the Warriors within one with a minute to play. - Davis then put the game out of reach when she scored into an empty net as Ridgewell tried to get to her bench. - Merrimack successfully pulled Ridgewell after Davis made it 5-3, and after sophomore Corinne Schroeder (24 saves) made two crucial stops, Cook and Compher combined to clear the puck to Parker, who deposited her eighth goal of the year into the back of the net. - Compher leads the nation with 28 assists and is first among Hockey East skaters with 41 points. - She notched an assist for an NCAA-leading 20th different time this year. - Davis tallied at least two points for the second straight game and for the 12th different time this year. - Parker has recorded five points (3g, 2a) over the past two games. - Rust has collected four points (1g, 3a) over the last two tilts. - Schuler became the ninth different Terrier to score a game-winning goal this season as well as the sixth different BU skater to record a two-goal game. - Schroeder made 15 of her 24 saves in the third period. - BU outshot Merrimack, 37-27. - The Terriers will conclude their home-and-home series with Merrimack on Saturday at Lawler Rink. Puck drop is set for 4 p.m.